The plaque and book project have been an initiative of The Legacy Association led by president Eva García. The idea of the plaque emerged from a visit that García paid to the Academy, “It very much stood out to me that the only mention of Spain was in a section related to the Cuban War and I decided it was imperative to do everything possible to convey in a more positive and fair manner the history of comradeship and cooperation between the Spanish and the US Navies. The idea of the book arose several months later with the goal to have documentation to support such a request. 2017 would mark the 200 years since the death of Jordi Farragut, a Spanish hero unjustly forgotten. García decided that the 200 year anniversary deserved the production of a book that would tell the history of the Spanish Legacy in the US Navy. With that in mind, in October 2016 she created an ambitious index and requested the cooperation of several expert historians in the field who selflessly collaborated in the production of an unprecedented book about the unknown relationship between the US Navy and the island of Menorca through the Farraguts and also for having been the permanent base for the Mediterranean Squadron, today the Sixth Fleet, from 1815 until 1848. Upon the completion of the manuscript, the Association presented the project to the Ministry of Defense which took an interest in its publication. 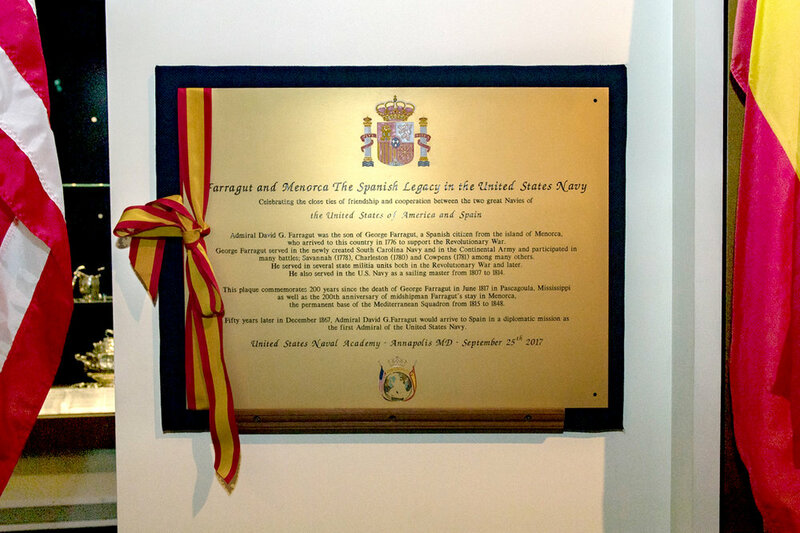 A few weeks later, in April 2017, The Legacy received the official confirmation: Spain was to have a designated place for the plaque in the Naval Museum, on its main floor in Preble Hall, in the heart of the US Navy, its naval academy in Annapolis. A location with more than one million visitors per year. President Garcia with U.S. Chief Naval Operations Admiral Richardson.